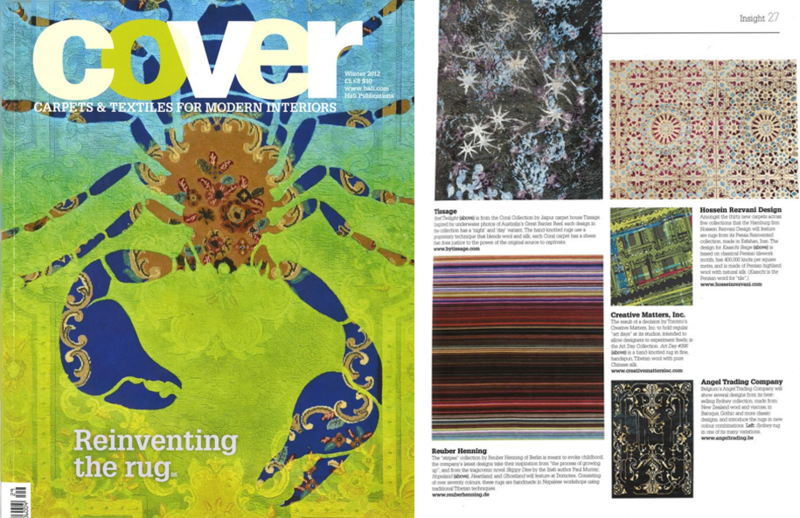 Selected to be included in the UPPERCASE MAGAZINE Surface Pattern Design Guide, Spring Issue #21, page 87. COVER Magazine Spring 2014. Creative Matters advertisement featuring "XXV - Suspension", designed by Ange Yake. Advertisement designed by Tiffany Wu. COVER Magazine Spring 2013. Creative Matters advertisement featuring Art Day #74 Platinum, designed by Ange Yake. Advertisement designed by Tiffany Wu. 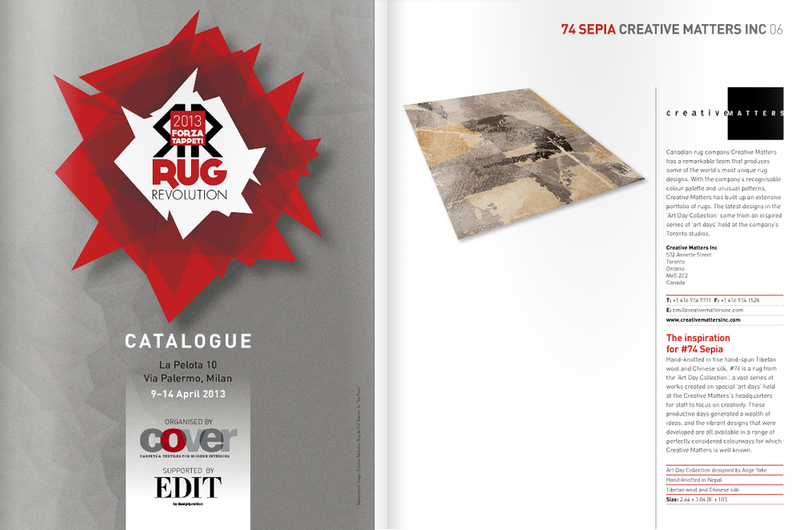 Creative Matters Carpet "Art Day #74" designed by Ange Yake displayed at Cover Magazine's Forza Tappeti: The Rug Revolution exhibition, during Milan Design Week. April 2013. COVER Magazine Winter 2012. Article "Fair Weather: Part I", featuring Creative Matters Carpet Art Day #396 Urban Designed by Ange Yake. Style at Home October 2012. Advertisement by modernweave featuring the Creative Matters Art Day Collection. Clockwise from top left: Art Day #13 Platinum (Designed by Ange Yake), Art Day #73 Sepia (Designed by Ange Yake), Art Day #103 Platinum (Designed by Robert MacDonald), Art Day #103 Graffiti (Designed by Robert MacDonald), Centre: Art Day #123 Platinum (Designed by Robert MacDonald & Ange Yake). COVER Magazine Autumn 2012. Creative Matters advertisement featuring Art Day #74 Sepia, designed by Ange Yake. (Creative Matters Ad designed by Tiffany Wu). 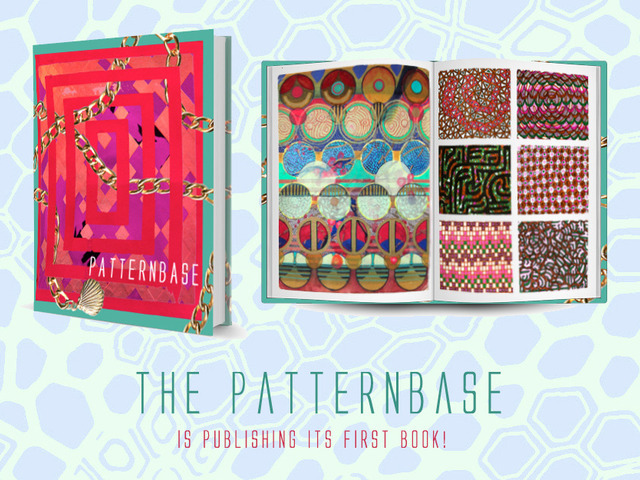 Two of my surface pattern designs were selected to be featured in "PATTERNBASE: A Collection of Contemporary Textile + Surface Design" by Kristi O’Meara from The PatternBase: Design Studio. July 2012. Style at Home July 2012. Creative Matters Carpet Art Day# 74 designed by Ange Yake in advertisement for modernweave. Do What You Love: Treasured Words. June 2012. Pattern students in the semi final! Spoonflower - Fabric8. Announcing the Fabric8 Semifinalists: 100 Amazing Fabric Designs. May 2012. Pattern Showcase #1 Monochromatic with Jacqueline Auvigne . Pattern displayed "BonBon" by Ange Yake. May 2012. Module 2 Final Showcase - Part 1 with Rachael Taylor. April 2012. 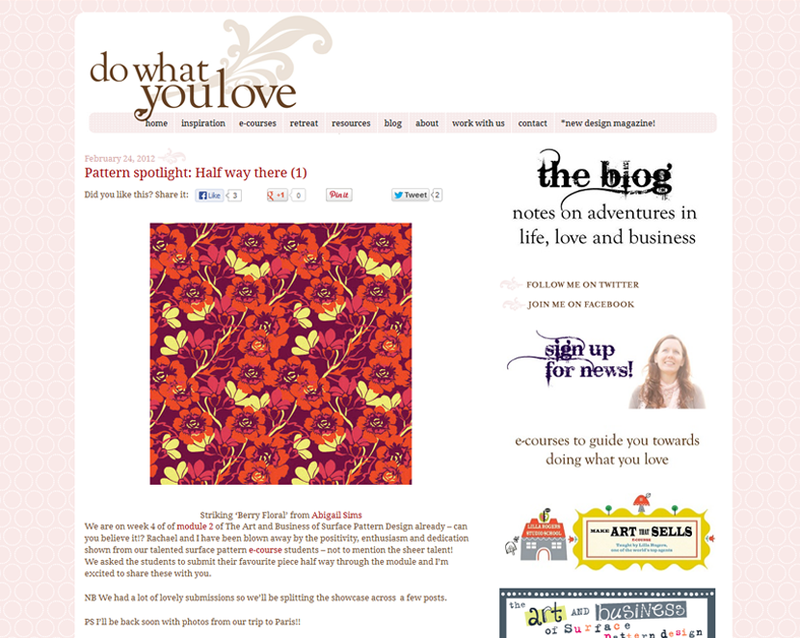 Pattern spotlight: Half way there (1) with Beth Kempton at dowhatyoulove.com. February 2012. Module 2 'Half Way There' (part 1) with Rachael Taylor. 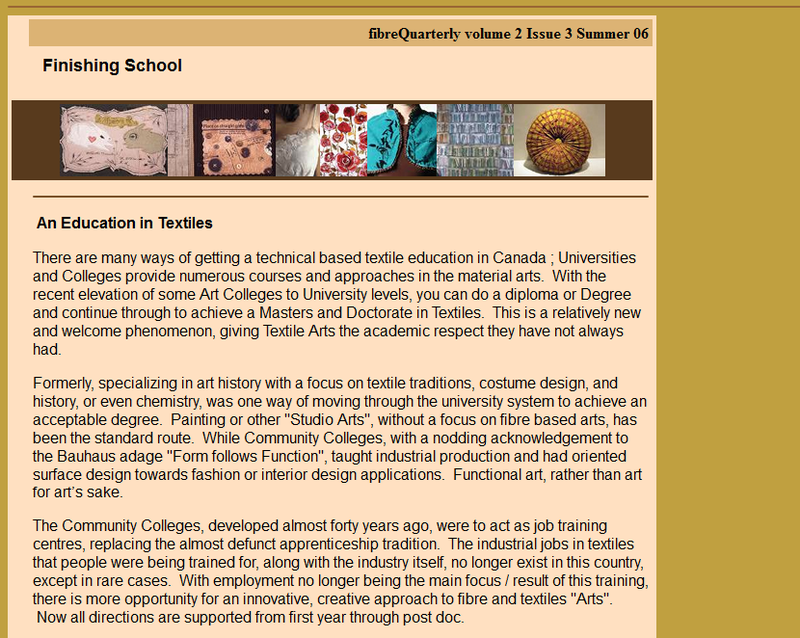 February 2012.
fibreQuarterly volume 2 Issue 3. "Finishing School". Summer 2006.